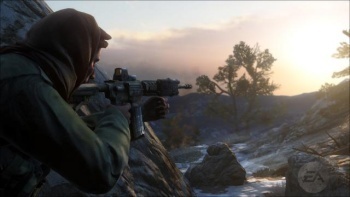 EA boss John Riccitiello claims he was "surprised" by the uproar over Medal of Honor, saying that nobody even noticed the presence of the Taliban until a journalist decided to take advantage of a grieving mother to stir up some easy controversy over the game. We all know what happened when word got out that the Taliban would feature as a playable faction in the multiplayer portion of EA's Medal of Honor reboot. People got excited, and not in the good way. Arms went up, harsh words were spoken, bans were called for; it was enough to bring Jack Thompson himself back for another kick at the videogame cat. But there was one man who apparently saw none of this coming: Riccitiello. "The controversy... kind of caught me by surprise," the Electronic Arts CEO said at the Bank of America Merrill Lynch Media, Communications and Entertainment Conference yesterday. "No-one noticed" that the Taliban was a multiplayer faction, he added, "until a journalist decided to put the game box in front of a mom who'd lost her son in Afghanistan to create some controversy." "I think that says more about the newspapers than it does the game industry," he said. "Having said that, we're incredibly sensitive to the challenges that a non-gamer who doesn't really understand what I've just described might imagine when a journalist who also doesn't understand a game describes it to her. It tends to excite a little bit of angst." Nonetheless, Riccitiello said he's "incredibly proud" of the game, although he reiterated an earlier admission that Medal of Honor isn't going to beat either Halo: Reach or Call of Duty: Black Ops this year. Next year, however, is another matter. "It's 2011 that we've always felt we can have a reasonable shot at recapturing the leadership," he said. "And from when we said that till 2011 that now seems possible."